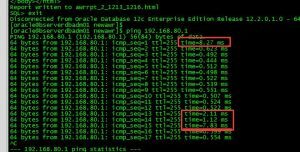 客户从IBM POWER迁移到EXADATA X6后遭遇大量的TCP SOCKET等待,该等待开销了大约15%的cpu资源, 系统运行未受影响,待过一段时间后,系统cpu降低,该等待减少. See Note:61998.1 for an introduction to Wait Events. KGAS is a component in the server which handles TCP/IP sockets which is typically used in dedicated connections in 10.2+ by some PLSQL built in packages such as UTL_HTTP and UTL_TCP. The KGAS interface is not involved in client / server communication but is a layer which may be used when a session on the server makes some outbound TCP/IP call using a PLSQL package such as UTL_HTTP. Packages such as UTL_FILE have also reported this wait when making an SMTP call. Note that this wait event is new in 10gR2. Earlier versions of Oracle doing the same operations would still wait inside KGAS for socket operations but such waits were not instrumented and so did not show up as waits. (or times out / errors as appropriate). If the TIME spent waiting for this event is significant then it is best to determine which sessions are showing the wait and drill into what those sessions are doing as the wait is usually related to whatever application code is executing . Check the current SQL / module / action of V$SESSION for sessions that are waiting on the event at the time that they are waiting to try and identify any common area of application code waiting on the event. Get an ERRORSTACK level 3 dump of some sessions waiting on the event. This should help show the exact PLSQL and C call stacks invoking the socket operation if the dump is taken when the session is waiting. Customers may need assistance from Oracle Support in order to get and interpret such a dump but it can help pinpoint the relevant application code. Trace sessions incurring the waits including wait tracing to try and place the waits in the context of the code executing around the waits. eg: Use event 10046 level 8 or DBMS_MONITOR.SESSION_TRACE_ENABLE. Use DBA_DEPENDENCIES to find any application packages which may ultimately be using UTL_HTTP or UTL_TCP underneath for some operation. 因为此时LCK0进程也在等待和kghfrunp(释放shared pool中内存)有关的latch,而在RAC环境里, row cache lock/library cache lock这样的instance lock的获取和释放必须经过LCK0进程,如果LCK0异常,那么就会发生row cache lock的问题.